ARRA News Service: Will Hillary cry for votes in South Carolina or Florida? 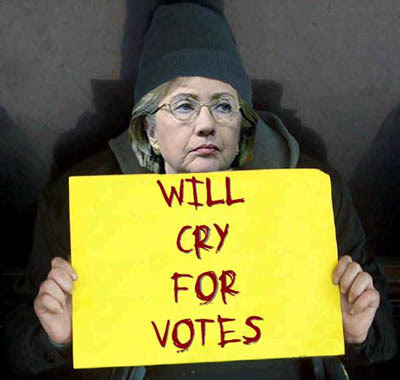 Will Hillary cry for votes in South Carolina or Florida? The South Carolina Democrat primary is Saturday (Jan 26) and Florida's is a week from Tuesday (Jan. 29). Rumor has it that while waiting for Super Bowl 42 on Feb 3rd, the Democrat race has even captured the attention of the Republicans. Everyone in the Nation wants to know how Obama, Obama's campaign, or "stand by your woman" Bill Clinton will affect Hillary. Even overseas bookies are giving odds on will "Hillary Cry for Votes." Tags: Election 2008, Democrats, Hillary Clinton, political humor To share or post to your site, click on "Post Link". Please mention / link to the ARRA News Service. Thanks!